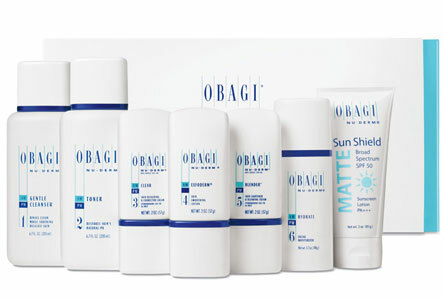 WE CARRY THE MOST POPULAR OBAGI MEDICAL PRODUCTS! Obagi Nu-Derm® helps to keep signs of aging at bay. This system keeps your skin tone looking prefect and keeps your confidence up. Complete skin care system specially formulated for normal to dry skin to help correct hyperpigmentation, such as dark spots and melasma, and transform the appearance of aging skin. A prescription topical treatment for acne vulgaris. Available in 3 strengths of Cream: 0.025%, 0.05%, and 0.1%; and one strength of Gel: 0.05%. Skin may become dry, flaky and sun screen must be worn every day. Using a broad-spectrum sunscreen SPF 30 or higher together with a comprehensive sun protection program including wearing sun protective clothing, hats, sunglasses, and avoiding the sun between the hours of 10am - 2pm may help reduce the risk of premature skin aging and skin cancer.